Preheat oven to 350. Toast the pecans (if you haven’t already) by laying them on a cookie sheet and baking for about 8to 10 minutes. Chop them. Line a 9 inch square pan with foil and spray foil with cooking spray or rub with butter. Thoroughly mix together flour, baking powder and salt. Cream the butter and sugar on high speed. Reduce speed slightly and beat in the egg. Add the vanilla. Add the flour mixture and stir until it’s blended in. Spread the mixture evenly in the pan. Sprinkle with nuts and most of the chocolate chips. Bake for about 20 minutes or until cookies are almost set. Do not overbake. Remove from oven and sprinkle remaining chips over hot bars. Let cool completely. 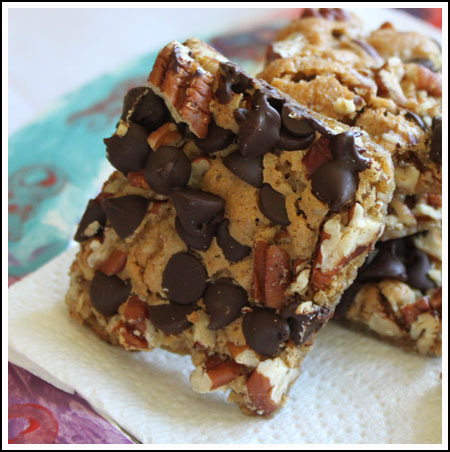 Lift foil from pan, set bars on a cookie sheet and score into 12 or 16 bars.